You can now use Voting Buttons in your email message to get a response from your intended recipient or recipients of your email using Outlook. This Voting button option in Outlook is very handy when you are trying to decide upon a meeting time or anything else to determine where your email recipient(s) are leaning. You can even use Outlook to do the grunt work for you and tally the votes for you. Note: When your recipient(s) get the email, they will see a highlighted line of text saying Vote by Clicking Vote in this Infobar and selecting your choice from the menu. 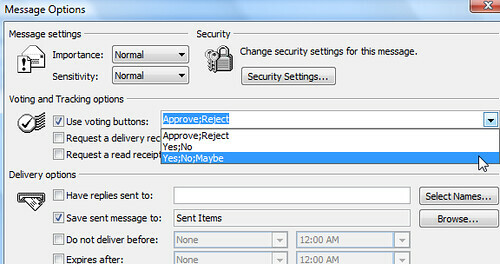 Once your recipients start replying, you could tally the votes yourself where you see a Yes;No;Maybe option of the recipient beside their name or you could let Outlook do the grunt work especially if your message went to a large group of people. Posted in TechTips. Bookmark the permalink.